For Day 22 its V. For that letter I had jotted down vegetable paratha. As I started preparing the parathas, the search on the internet intensified and I came across this very interesting roti —V for Vastad Roti. 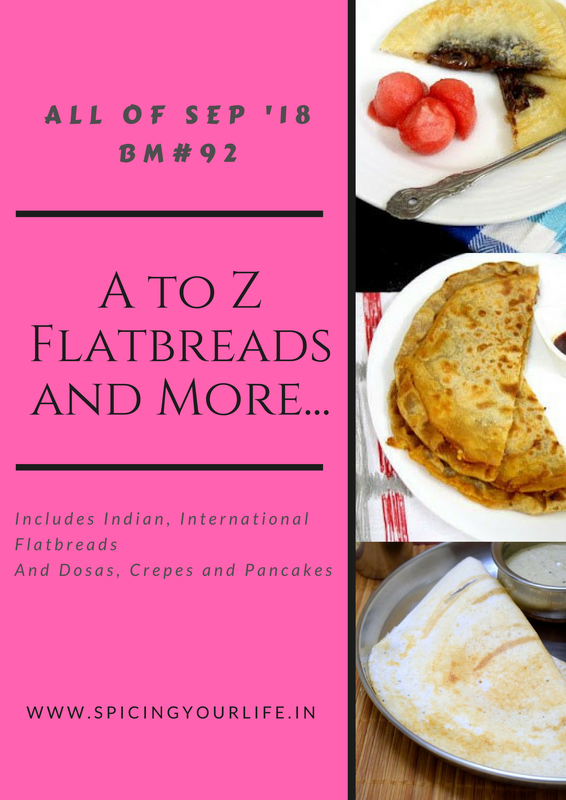 Its a Mangalorean- Konkani flatbread that is similar to Mangalore Buns. Reading Mangalore Buns was enough for me as that has been on my list to try for so long. If not a fried version than at least let me try the roasted version I thought. Vastad Roti is slightly sweetish because of the ripe banana added to it and its super soft. Its a roti that is ideal to mop up curries. Its usually served with a spicy curry to balance the sweetness or with the simple dal preparation Dalithoi (dalithoy). Would I make this roti again? yes, definitely because it was really delicious. I served it with dalithoy and hubby and I loved the combination. Next time will serve it a spicy curry. These rotis can be quite heavy so I made only 4. If you need to make more then double the recipe. You can use either plain or wheat flour or use a mixture. Mix flour with salt, sugar, coarsely growing pepper, jeera and baking soda. Add oil and rub into the flour. Add mashed banana and mix. Add yogurt a tbsp at a time to make soft dough. it should not be sticky. Knead it till its smooth. Shape into a ball. Rub ghee or oil over the dough. Cover and let it ferment for 5-6 hours. Roll each into a ball and roll it in the flour. Take one part and roll it out into a circle of 5-6 inches in diameter. Use flour whenever necessary. Put the rolled roti on the hot tawa. Let it roast for 2-3 minutes. Flip it over and roast for 2-3 minutes. Using a spatula, gently press it down at the edges till brown specks appear and the under side is cooked. Flip the roti and press down gently with a spatula till its cooked. Repeat steps 9 to 16 with the remaining dough. Serve vastad roti with your favorite curry or dalithoy. Instead of roasting the roti without ghee or oil you can smear ghee or oil on both sides and roast it. When you add mashed banana, the dough will bind together so be careful how much yogurt you use. Vastad rotis with dalithoy, i would love to enjoy this combination even for my dinner rite now, love this sweet and dal combination, though this combination weird for my family members, i simply love this combination. Lovely pick Mayuri. Thanks Priya.. for Gujjus not weird at all as we love both sweet and chilli taste. I made dosa with banana….never thought a roti could be made too. Awesome pick for V…looks so delicious! Thanks Sowmya, these Mega BM makes us search for unique recipes. Same pinch Mayuri. We loved these rotis very much and you have made them beautiful as well. Thanks Harini and yes we loved them with the curry. Same pinch Mayuri. Even I made the same. Loved it to the core. Banana adds a nice flavour to the rotis. Yours have turned out perfect..
Great pick with V and unique bread for me.. Love the addition of banana. Thank you so much Srivalli, I like the thickness as that made it easy to have with the curry. This is one roti which mega BM has introduced to me . I somehow could never think of banana in a roti , but it seems this is a very popular roti . Yours have come out really well , they look nice and crisp too . I am sure you don’t need an accompaniment with it . Thanks Vaishali, I too heard about for the first time when I was doing my research. Loved it as it doesn’t turn out too sweet. Wow banana and yogurt directly mashed in a roti makes it more healthy. They look so perfectly done and yum. Thank you so much Renu, these rotis turned out really good. Mangalore buns are kisd favorite here. Making a roti version on it is equally yum! Nice choice for V, Mayuri. Thank you so much, we too loved this roti. after reading vastad roti I felt as if my screen smelling like ripe banana.. just loved this roti. I too find this roti while seraching but did not check how to make it. I decided to make my vrat recipes. You made them so beautiful. Thank you Bhawana, I find that sometimes cooking and clicking too difficult especially when its cloudy as then I don’t get natural light in the kitchen. Thank you Bhawana, try these rotis, they taste so good with any dal or curry. Dali Thoy is my boys favorite dal ever in this world and I make it at least once a week. I will have to try this vastad roti soon to go with it. Looks so delicious and my house has a never ending supply of over ripe bananas. Thanks Ritu, the roti was not too sweet so they like it.